Wilkins Ice Shelf hangs by a thread. Rebranding opportunities abound. Big news on global warming this week. 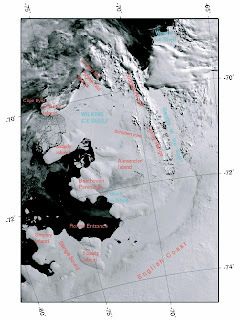 The Wilkins Ice Shelf, an area of floating ice about the size of Connecticut off the coast of Antarctica, has started to collapse. Block after block of ice is just tumbling and crumbling into the ocean, said Ted Scambos of the National Snow and Ice Data Center. The good news is Wilkins is only 1 of 19 ice shelves around the southern continent, so we still have 18 left. Um. Yeah. Whatever your politics, people are going to start noticing this stuff. Maybe it’s time to put more green in your corporate logo. Melts in your gulf, not in your hand? Build your site on SLAED Open! SLAED is a powerful site with minimum requirements for hosting, high levels of protection and a superb choice for the creation of a site of any complexity! SLAEDOpen is an Open Source (GPL).